What: 25th Annual Soroptimist Garden TourWhere: Six locations throughout western Nevada CountyWhen: May 19-20, 10 a.m.-4 p.m. Step into a world of beauty and wonder at the 25th annual Soroptimist International of the Sierra Foothills Garden Tour Saturday and Sunday, May 19-20, from 10 a.m. to 4 p.m. This popular event allows the public into some of our community’s most beautiful and elaborate private gardens, and the homeowners who have created them are on hand to answer questions and welcome you into their world. 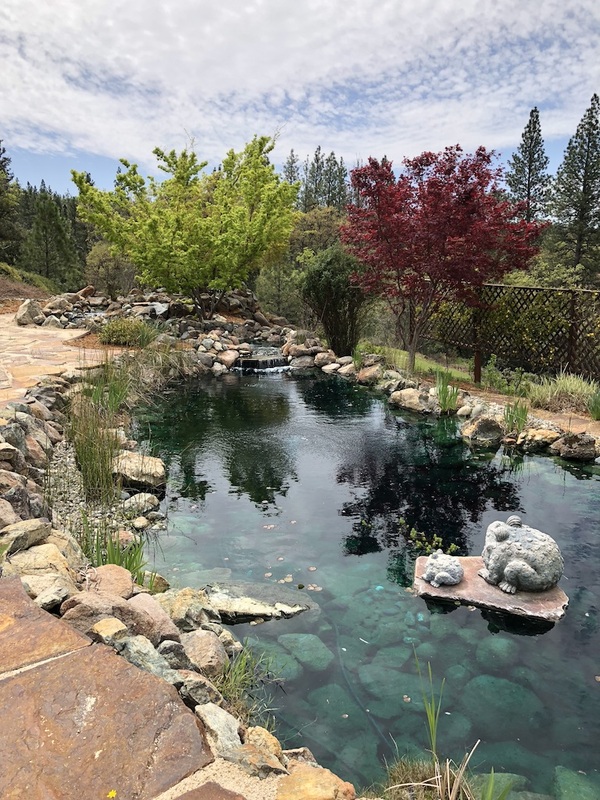 This year, six diverse gardens from South County to north of Nevada City will be featured on the tour, giving attendees a glimpse of the secret worlds of residents at different elevations and climates. Each garden is uniquely special, and has been chosen for the meticulous love and care that is taken to keep each one well maintained year round. Chuck and Penny Bess own five acres of land, and approximately two acres make up their beautiful garden full of poppies and bursts of color. A fine gravel walkway winds down to a brilliantly blue creek that feeds into a rock pond. Dozens of purple water lilies sit floating on the water. Bamboo grows around the outer edge, framing the pond in a light green. Chuck and Penny planted white crape myrtle trees, rhododendron, and Japanese maples around the pond, surrounding it with vivid color. In the distance, you can see a small orchard, where bears, foxes, and other wildlife graze on fruit late at night. 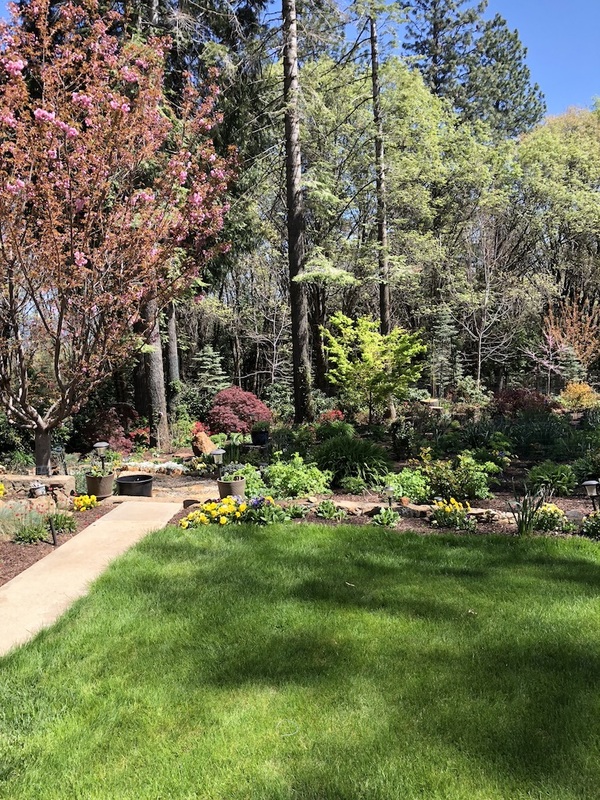 With the help of their own personal gardener, Victor Florez, Chuck and Penny have planted red and green Japanese maples, sequoia redwoods, and plenty of lilacs, creating a peaceful yet vibrant landscape. Bob and Patty Park refer to their garden as Conifer Hill, yet a more accurate description would be Conifer Kingdom. A series of gravel walkways and stepping stone paths lead visitors up, down, and around a garden comprised of 300 conifers and maples, revealing a different type of conifer at every turn. Bob and Patty say they became “coneheads” after making a trip to the American Conifer Society Western Regional Conference in Silverton, OR. Within two weeks of returning home, a large patch of lawn was ripped out and Conifer Hill was born. They haven’t stopped planting since. 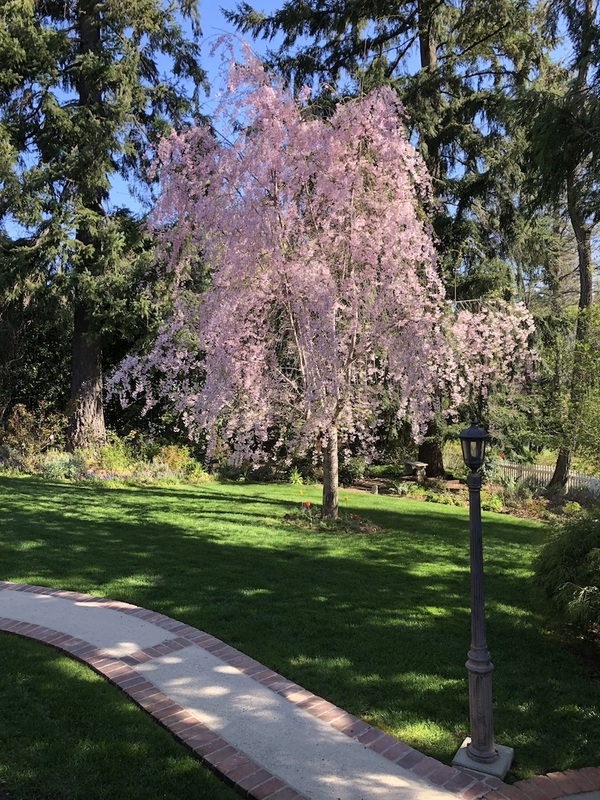 While the main features of the garden are conifers and maples, they also have a wide variety of other plants, shrubs, and bulbs, along with a large vegetable garden. And they just keep adding to the garden each year. 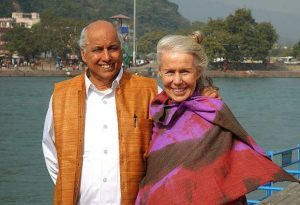 Bob and Patty have created a garden that represents a lifetime process of growth and evolution. 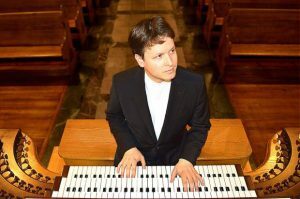 Hazel Shewell grew up in Kent in the South of England, and spent many years adventuring in the United States before landing in Nevada City in 1989. Missing her roots, Hazel and her husband Paul, also British, worked with John Braga, a landscaper and designer, to turn their 2/3rds of an acre into a charming, English garden. In the back yard, a beautiful plum tree grows in the middle of a cement patio. To the left is a beige and white cottage that Hazel uses as a room to practice her pottery. Against the back of the house is a small vegetable garden where she grows artichokes and sweat peas. The side yard contains a Pétanque (similar to Bocce Ball) court that Hazel designed herself. At the front of the house, a brick pathway (made from the remnants of an old chimney) winds its way through two large plum trees that Hazel uses to hang her hammock between in the summer. Further down the path are planted ferns and azaleas surrounding a white birdbath. A large part of the yard is covered in bluebells and scilla, giving the front garden a beautiful bluish hue. This garden embodies Hazel perfectly; English, free spirited, eclectic, and vibrant. Louise Krusi’s garden feels like a walk in the woodlands, as the garden is lush and includes an array of shade-loving plants. She has cultivated an enchanting garden with English roses, cherry trees, and seven little happy dogs that follow Louise around her yard. Behind the house is a beautiful pool and patio with a little outside bar shaded under an open structure – the perfect summer spot. Across the pool is a raised stone pond with at least a dozen orange and black goldfish. A couple of bright yellow forsythia trees line the fence, outlining the right side yard in gold. To the left is a fountain surrounded by daffodils and English violets. In the front yard, a large cedar tree wrapped in wisteria stands in the middle of a brick courtyard, and to the right is a walking garden with perennials, shrubs, and tall trees. Stone benches, metal archways, and fountains decorate the garden walkway. This garden is truly a woodland paradise! If you were to walk all of the paths, sidewalks, and steps of LeRoy and Sally Hall’s garden, you would have covered 9/10ths of a mile. 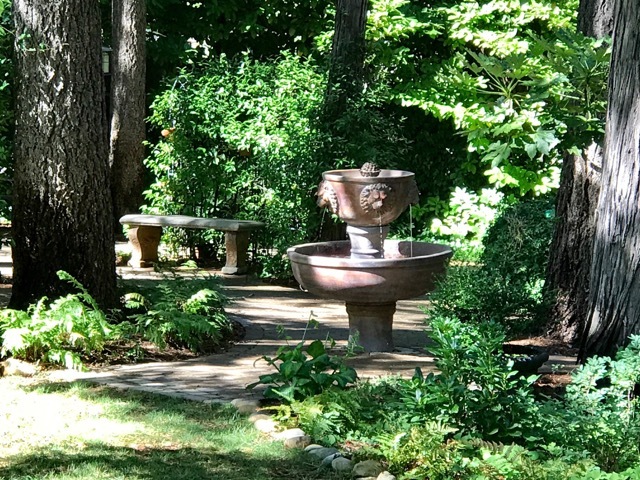 Their front yard, reminiscent of Frances Hodgson Burnett’s The Secret Garden, is a beautiful, explorative garden with narrow gravel walkways, as well as several stepping-stones that provide a detour off the beaten path. 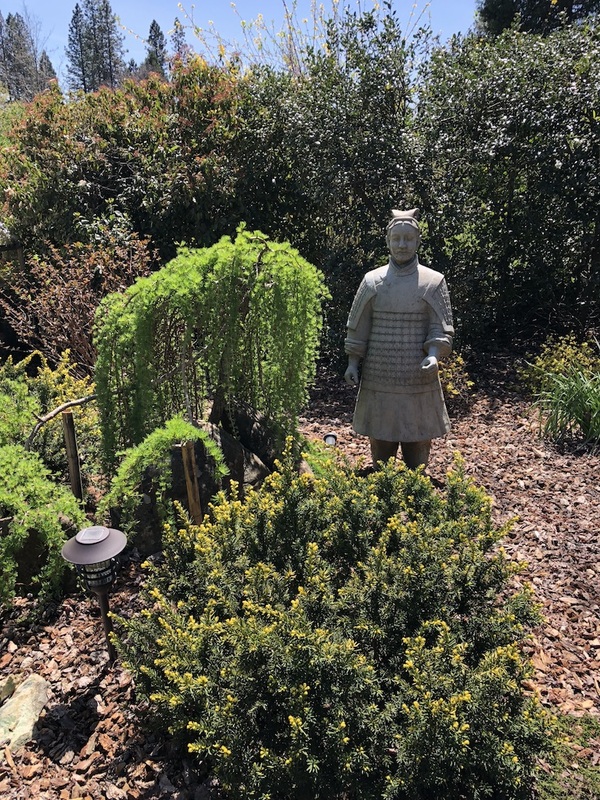 The walkways will guide you to the main attractions, such as the azaleas and the Japanese maples, while the stone paths will lead you to the more secret areas of the garden that can’t be seen from main route. While the front yard is more shaded, the back yard is brilliantly sunlit. LeRoy and Sally turned what was once an outdoor pool into a sunken patio, the perfect place to sit and admire their garden, as well as bird watch. To the right of the courtyard, a dozen finches and canaries chirp and play in Sally’s wooden aviary. Across the patio is a field of thousands of flowers: azaleas, peonies, dianthus, roses, and most abundantly, daffodils. But it’s not only a flower garden; LeRoy and Sally grow their own vegetables, too. On the other side of the house, to the left of the back garden, a red-wooden lookout measuring 18 ft. off the ground stands out among the oaks, cedars, and pine trees (which they planted themselves). It’s a wooden observation tower that overlooks all 1½ acres of the couple’s twenty years of work, which LeRoy built for Sally’s 70th birthday. The entrance to Rebecca Bleau’s garden passes under three metal archways wrapped in wisteria, hinting at the whimsy you will find inside. Past the archways, daylilies and sweet williams sprout on the left-hand side of the path. On the right are foxglove and love-in-a-mist, two of Rebecca’s favorites. If you were to view Rebecca’s front yard from the house porch, you’d notice that the garden path creates the outline of a fish. A prominent piece of the front garden is a gazebo engulfed in climbing jasmine vines that took Rebecca twelve years to grow. When in bloom, it fills the garden with a powerful yet delightful fragrance. 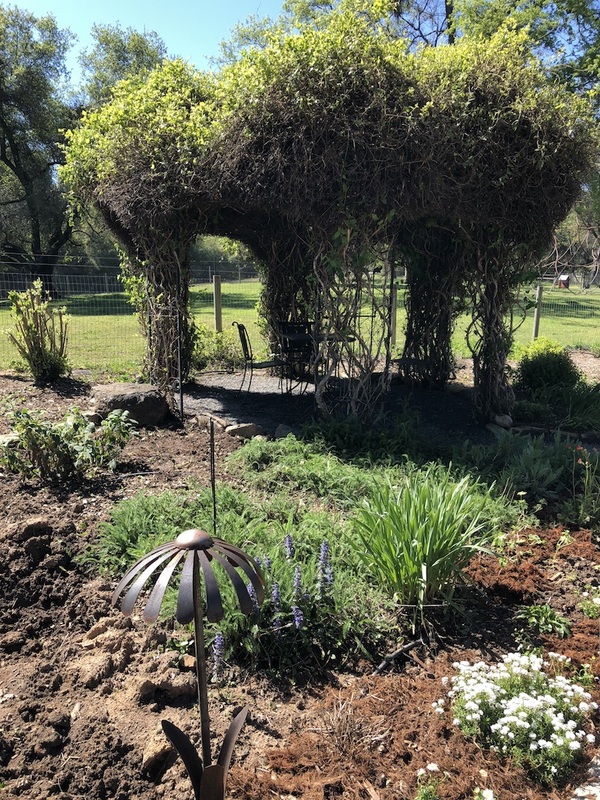 Another intriguing aspect of Rebecca’s garden is her featured art, a large geometric metal sculpture which was originally an art installation at Burning Man a few years ago. A fairly new addition to her home is a beautiful pond in the side yard that Rebecca and her mother Ruth made together. Next to it is where she plants all her herbs, such as rosemary, thyme, basil, and more. In the back yard is a very large, bountiful vegetable garden where Rebecca grows tomatoes, squash, chards, potatoes, peppers, and almost every other vegetable. The cost to attend the Soroptimist Garden Tour is $25 in advance, and $30 at the garden gates. For more information or to purchase tickets, call 530-273-7989 or visit https://www.sierrasoroptimist.org/2018-garden-tour.